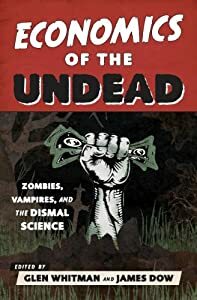 This article on Haitian zombies, which includes a history of attempts to explain their existence in scientific terms, reminds us that zombie folklore is historically inseparable from slavery. Haitian zombies were created not by a virus, but by a sorcerer (bokor) whose black magic created undead laborers who would work indefinitely for free. This suggests that zombie labor might be analyzed in the same manner as slave labor. In a justly famous (or infamous) book titled Time on the Cross, economists Robert Fogel and Stanley Engerman made the controversial claim that slavery in the American South was actually an efficient economic institution. It’s worth pointing out that “efficient” isn’t necessarily the same as “moral”; their argument was purely economic, not ethical. Nevertheless, the book unsurprisingly generated a great deal of criticism, from economists and others. What this analysis ignores (or rather, one thing it ignores) is the costliness of turning a free person into a slave and keeping them that way. First, there are the costs associated with capture and enforcement, such as slave ships, overseers, and fugitive slave hunters — all of which are valuable resources that could be used for other purposes. Second, and more subtly, there are the costs created by the incompatibility of slave labor with certain types of production. It is relatively easy to extract the maximum amount of cotton-picking from a slave. It is much harder to extract the maximum amount (and quality) of entrepreneurship or novel-writing or mathematics instruction from a slave. How can you tell whether they’re really doing their best? Extracting the optimal effort requires incentives, in the form of wages and profit shares — which represent partial movements away from pure slavery and toward self-ownership. Pure slavery, at least, tends to lock slave labor into lower-valued uses because higher-valued uses are incompatible with the means of enforcement. Now back to the zombies. If zombies are people who were already dead of non-zombie causes and reanimated after the fact, there’s a really strong case for the efficiency of zombie labor, provided that the cost of reanimating them isn’t too large. If a zombie creates any value at all, that’s more value than a corpse in the grave would have created. If this is how zombies are indeed created, then they represent an extreme case of slavery — and its inefficiency. The relevant comparison is not between a zombie and a corpse in the grave, but between a zombie and a live human being. The application of the neurotoxin and the mind-control drug are analogous to the cost of slave ships, overseers, and fugitive hunters. But more importantly, the zombified individuals lose the ability to do sophisticated labor; they becomes mindless and non-communicative. As a result, their labor is confined to low-valued uses, which for at least some zombified individuals represents a notable reduction in economic value. As with regular slaves, zombified workers’ highest-valued uses may be incompatible with the means of enforcement. This entry was posted on Tuesday, August 12th, 2014 at 9:22 am	and posted in Uncategorized. You can follow any responses to this entry through the RSS 2.0 feed. Glen, I have to respectfully disagree with your application of the Coase Theorem to the institution of slavery. First, though, I have to confess that I am fascinated by the CT (see my paper “Clones and the Coase Theorem” where I apply Coase’s ideas to the film Blade Runner — spoiler alert: I argue that the source of the replicants’ violence in Blade Runner is Dr. Tyrell’s monopoly over the production of the replications: http://papers.ssrn.com/sol3/papers.cfm?abstract_id=1991411). But in the case of colonial-era slavery, we can’t say whether or not slavery is efficient since slaves do not have the option to purchase their manumission on a voluntary basis. In other words, I tend to equate the Coase Theorem with “Coasian bargaining” to an efficient result, but by definition no bargaining is going between slaves and slave-owners! We are reblogging this fascinating post by Glen Whitman on “Haitian Zombies and Slave Economics” because we respectfully disagree with Professor Whitman’s application of the Coase Theorem to the institution of slavery. (First, though, we must confess that we are fascinated by Coase’s theorem — see our paper “Clones and the Coase Theorem” where I apply Coase’s ideas to the film Blade Runner — spoiler alert: I argue that the source of the replicants’ violence in Blade Runner is Dr. Tyrell’s monopoly over the production of the replicators. But in the case of colonial-era slavery, we can’t say whether or not slavery is efficient since slaves do not have the option to purchase their manumission on a voluntary basis. In other words, we tend to equate the Coase Theorem with “Coasian bargaining” to an efficient result, but by definition no bargaining is going between slaves and slave-owners! Enrique, I must respectfully disagree with your respectful disagreement! Of course, as I said in the post, I ultimately think the Coase Theorem doesn’t work in this case for a different reason. But I don’t think your objection is right. No negotiation is required on the part of the slave/zombie, just as negotiation is required on the part of a work animal or piece of capital equipment. The only necessarily negotiations would be between the owner of the asset and someone else who might want to use it. To use the example in the text, if the slave/zombie generates greater value by rolling cigars than by picking cotton, and the slave/zombie is currently owned by cotton farmer, the cotton farmer can sell or rent the slave/zombie to the cigar maker. I want to emphasize again, as I did in the post, that this is a purely economic argument, not an ethical one. The slave would be much happier if we were not a slave, and ethically he ought to be free (unlike a piece of capital equipment). The economic point, though, is that even if he were free, the worker would end up working for the cigar maker rather than the cotton farmer if cigar-making is where he generates greater value. He would sell his labor to the highest bidder, the cigar maker. And because he owns himself, the wages would go to him instead of to the cotton farmer. One more point, which may be what you were getting at. If the worker happens to have a preference for one type of work over the other, rather than caring only about the monetary return generated by his work, then it’s possible that self-ownership vs. slavery will make a difference to the allocation of the worker’s labor. For instance, suppose cotton-picking is worth $8/hour and cigar-rolling is worth $10/hour, but the worker prefers cotton-picking over cigar-rolling by a difference of $3/hour. In the case where the worker is a slave, his work will be allocated to cigar-rolling. In the case where he owns himself, he will pick cotton instead. But so long as the worker has no preference for one type of work over another, I stand by my original argument. It’s also worth noting that this objection is really not a problem for a sophisticated version of the Coase Theorem. The Coase Theorem doesn’t really say that the allocation of assets will be the *same* regardless of initial ownership, but that it will be *efficient* regardless of initial ownership (provided transaction costs are small). What is efficient depends on demand functions, and demand functions depend on wealth and income. In the case where the worker is a slave, he has much lower (arguably zero) wealth and income, and therefore cannot afford to purchase the right to do his preferred work. In the case where he owns himself, he starts with a much higher wealth and income, and thus he can afford afford to purchase that right. So this would be a case where what’s efficient turns crucially on the initial ownership of assets. Thanks, Glen, for taking the time to address my objection above. Yes, I am prepared to concede (for the sake of argument) that ethics and economics are two separate fields, but are these two fields separate and “non-overlapping magisteria” (to borrow Stephen Jay Gould’s beautiful phrase about science and religion)? I, for one, don’t think so. On the contrary, economics has a lot to say about ethics (and that ethics has a lot to say about economics).